tags: Children of the Night...Beware! Mankind is threatened by a race of creatures called the Nightbreed, people who have, either willingly or through deception, succumbed to supernatural beings. And hunting them down is a man named Shido. A detective. A warrior. A vampire. And with the help of an urban spirit, his naive secretary, and a police agent assigned to special cases, Shido stands as a vanguard against the Nightbreed. But he has his own difficulties as well. Including his sire, the mysterious Cain, and his prophecies of the Golden Dawn... Maybe I am a bit to critical! But for an anime from the year 2000 I expected better animation! I must admit that I enjoyed some of the episodes with the last episode "eternal darkness" being best! Overall this anime lacks an original and exciting story! The action was great and entertaining! But I did have problems with "Shido"'s inconsistency using his powers! One episode he is able to run up a building! And another episode he can't even get out of a dried up well! I did like his ability to use his own blood as a weapon! I can't recall this ever being done in a series about vampires! (Maybe now people will jump up and mention "Blood+". In "blood+" blood was used to finish off demons but not made into a sword or flying projectiles like in "Nightwalker") It is too bad you don't get to know "Shido" well! He is a Vampire with a past and a life before he became a Vampire! But for some reason he can't remember his past! This anime could have been much better if they deepened his character by telling some of his past adventures! Comparing this to other anime and about vampires this a nice and decent addition! 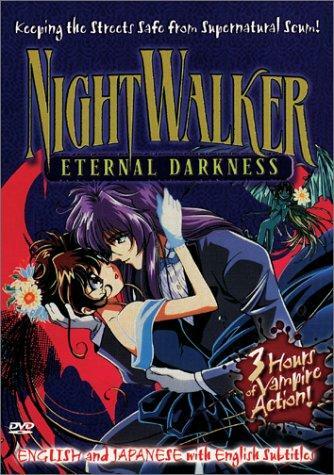 I loved Night Walker, It had everything an anime should have. Shidou's character was very well defined, along with Yayoi and Kaine. I recommend this anime for everyone, even those who have never seen an anime in their lives would probably enjoy this. This show had me on the edge of my seat all the way till the end, definitely a thrill ride worth staying up till 2 am on a school night to see. Not that I recommend doing that...<<; (Yea..it's worth it.) So if your interested, rent it, if you like it buy it. If your just a stupid water head who likes to hate on good anime..Be smart..Don't even pick it up and go back to your teenage dramas. -The Dunpeal Fox The music was composed by Akifumi Tada. Yes, The soundtrack was released on October 14, 1998 by Universal Music Japan. Yes, a 16-bit 16-color PC game was released in 1993. It was later released in 2001 by the company Arieroof for the Windows 2000, but only in Japan.